The figure is not drawn to scale. AB and CDare straight lines. 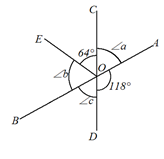 Find all the unknown angles in the following figure. ∠a = °, ∠b = °, ∠c = °.